MIDDLETOWN, RI – July 25, 2018 – KVH Industries, Inc., (Nasdaq: KVHI), is pleased to announce that Transpetro has chosen KVH VSAT connectivity after conducting a competitive process for selecting new connectivity services for the majority of its tankers. Brazilian-based Transpetro provides transportation for the state-owned Petrobras oil and gas company. Transpetro chose KVH’s TracPhone® V7-HTS satellite communications antenna system with a five-year airtime contract for 45 tankers, a combination of newbuilds and existing tankers. The installations will take place throughout the next 12 months in Brazil, where KVH’s subsidiary, KVH Brazil, has been in operation since 2011. 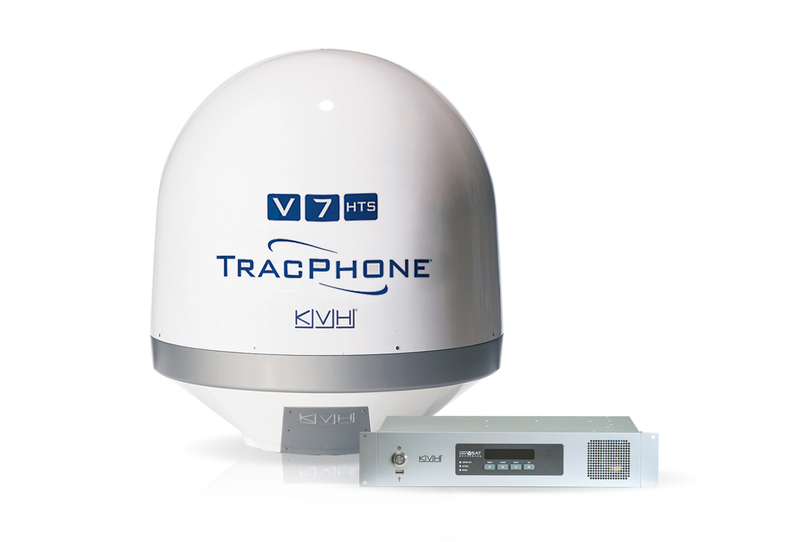 KVH’s TracPhone V7-HTS is a 60 cm Ku-band satellite communications antenna designed for the mini-VSAT Broadbandsm network, which utilizes high-throughput satellite (HTS) technology. KVH’s mini-VSAT Broadband network provides global maritime coverage and the TracPhone V7-HTS delivers data speeds up to 10 Mbps download, and 3 Mbps upload. Each TracPhone V7-HTS includes a belowdecks Integrated CommBoxTM Modem (ICM), with built-in capability for onboard network management solutions. MIDDLETOWN, RI – July 23, 2018 – KVH Industries, Inc., (Nasdaq: KVHI), announced that it recently shipped its 8,000th mini-VSAT Broadbandsm system. The TracPhone® V-series satellite communications antenna systems utilize advanced satellite technology, including the latest high throughput satellites (HTS), to meet the growing demand for more onboard broadband connectivity. 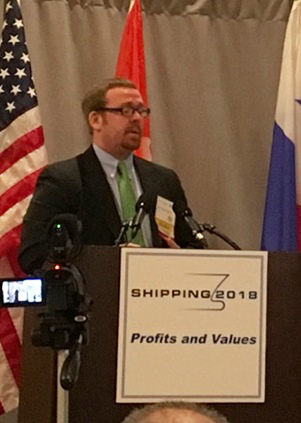 Ryan Smith from KVH and Dan Lesmez from Intelsat teamed up at CMA Shipping 2018, the annual conference of the Connecticut Maritime Association, yesterday to explain how ship owners, operators, and managers can take advantage of the commercial benefits gained from switching to High Throughput Satellite (HTS) technology by using Connectivity as a Service (CaaS). KVH Videotel announced today that Steven Gosling, a master mariner and former manager with leading maritime organizations, has joined KVH Videotel’s content team as quality assurance manager. 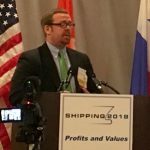 Mr. Gosling’s responsibilities will include monitoring legislative movements, trends, and best practices in the industry, and guiding the KVH Videotel content and software development teams in serving the maritime community’s learning and development needs. Mr. Gosling will also be responsible for spearheading KVH Videotel’s continuing professional development (CPD) offering. 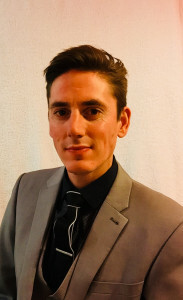 Prior to joining KVH Videotel, Mr. Gosling held roles as head of strategic development for Nautilus International; training & quality manager for The Nautical Institute; and deck officer with the cruise ship industry. He earned an MSc. in maritime operations and management from City, University of London. MIDDLETOWN, RI – December 14, 2017 – KVH Industries, Inc., (Nasdaq: KVHI), and Pilipinas Global Network Limited (PGNL) today announced a deal to bring coverage of Philippine Basketball Association (PBA) full games to merchant ships. MIDDLETOWN, RI – November 20, 2017 – KVH Industries, Inc., (Nasdaq: KVHI), today announced that it has concluded arrangements with SKY Perfect JSAT (SJC) to work together in delivering next-generation maritime broadband services. 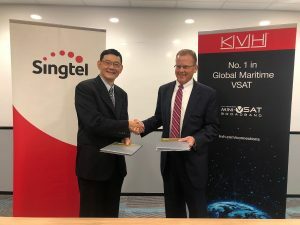 KVH’s advanced mini-VSAT Broadbandsm service will incorporate capacity from SJC’s satellites covering the Asia-Pacific and Indian Ocean regions, inclusive of unique southern Indian Ocean coverage. This new-generation maritime broadband service is designed to achieve maximum data speeds of 10 Mbps download, and 3 Mbps upload, using the new KVH TracPhone® V7-HTS, a 60 cm Ku-band maritime satellite antenna system that KVH designed for the advanced network. In addition, SJC will be marketing and selling the next-generation service in Japan under the name “OceanBB.” According to SJC, entering into these agreements with KVH enables SJC to accelerate its development and provision of next-generation services that will meet the ever-growing demand for maritime broadband. MIDDLETOWN, RI, USA, and LONDON, UK – July 13, 2015 – VideotelTM, the leading international provider of e-Learning maritime training solutions and a company of KVH Industries, Inc., (Nasdaq: KVHI), has received the approval of the Norwegian Maritime Authority (NMA) for its security training courses. Videotel’s “Maritime Security Awareness,” “Designated Security Duties,” and “Shipboard Security Officer” training courses have been approved in their entirety by the NMA for meeting the Standards of Training, Certification and Watchkeeping (STCW) codes, and seafarers completing these courses will receive the necessary qualifications and certificates for shipboard duty. The NMA approval enhances Videotel’s reputation with Norwegian ship owners, ship managers, and the offshore sector, which are guided by the Authority on maritime issues. A major maritime center, Norway has a merchant fleet of approximately 1,400 vessels; in 2013, it had one of the top 10 merchant fleets in the world according to deadweight tonnage. MIDDLETOWN, RI, USA – July 1, 2015 – KVH Media Group, part of KVH Industries, Inc., (Nasdaq: KVHI), has launched “Philippine Business,” the 100th unique newspaper title produced under the NEWSlinkTM brand. The new title joins NEWSlink’s roster of high-quality daily and weekly newspaper digests, which are currently enjoyed by seafarers and cruise guests on more than 8,500 vessels around the world. Produced for the multinational audience common to the seafaring world, the NEWSlink titles cover news, sports, finance, and entertainment news in 17 languages tailored to 80 different regions and countries. The titles are produced in NEWSlink newsrooms located in Liverpool, Delhi, and Manila, where a near 24-hour news monitoring service ensures the most current information is included in every edition. KVH Media Group delivers the NEWSlink titles in a range of formats and through a range of technologies, and specializes in compact formats for maritime and other industries where bandwidth is limited or delivery costs are high. The newest delivery method for NEWSlink titles is KVH’s recently introduced IP-MobileCastTM content delivery service, which utilizes multicasting technology to broadcast a wide range of news and entertainment content to ships at sea. The latest NEWSlink title, “Philippine Business,” is a weekly edition containing stock market and company news plus financial hints and tips, written for a seafarer audience. “Launching this specialist weekly NEWSlink edition is a direct response to requests by Filipino crew, who contacted us to ask for more business and financial coverage so that they can be better informed on how to invest their money,” says Mark Woodhead, managing director of KVH Media Group. Of the 100 NEWSlink titles in the portfolio today, “Philippines,” a general-interest, four-page title, is the most highly subscribed national edition. Other titles include: “The International,” an eight-page daily edition; and “Maritime News,” a four-page daily newspaper focusing on everyday shipping news for crew. Special-interest editions are also produced, such as an overview of national election contests, and “Boxing Special,” which included a report on the Mayweather versus Pacquiao fight.